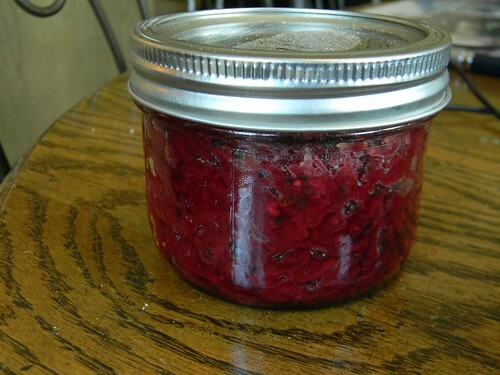 Beet Relish #SundaySupper | What Smells So Good? Heat a dry saucepan on medium to high heat and add the mustard seeds. Cook until they start to pop. Turn the heat down to medium and add the oil and onion. Cook, stirring, until translucent. Add the sugar, water, wine, allspice, cinnamon, ginger, vinegar, salt, beets and radishes, stirring to combine. Cover and cook 20 minutes, then uncover and cook 20 minutes. Stir frequently to prevent burning. Process 20 minutes in a water-bath canner, or store in the fridge up to 1 month.